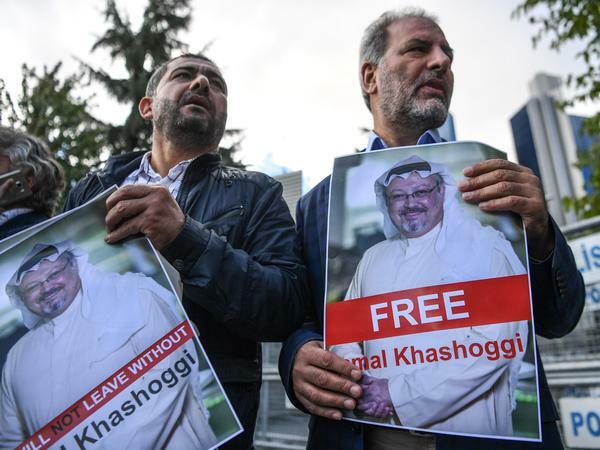 Protestors hold pictures of missing journalist Jamal Khashoggi during a demonstration in front of the Saudi Arabian consulate, on Friday in Istanbul. Turkish President Recep Tayyip Erdogan told Reuters and other outlets on Sunday that he was following the case and hoped for a positive outcome, and that authorities were examining surveillance camera footage and monitoring airport departures and arrivals. "God willing, we will not be faced with the situation we do not desire," he said. But an advisor to Erdogan, Yasin Aktay, told Reuters on Saturday that the initial finding of the Turkish police "is that Mr. Khashoggi has been killed at the consulate of Saudi Arabia in Istanbul. We believe that the murder was premeditated and the body was subsequently moved out of the consulate." "There is concrete information; it will not remain an unsolved case," Aktay said Sunday in an interview with the Turkish CNN network, The New York Times reported. "The consulate should make a clear explanation." Other Turkish officials, speaking on the condition of anonymity, told outlets that they believed Khashoggi had been killed. The Saudi government vehemently denied those reports. On Sunday, the Saudi Press Agency released a statement, quoting an official at Saudi Arabia's consulate in Istanbul, who "strongly denounced these baseless allegations, and expressed his doubt that they came from Turkish officials that are informed of the investigation or are authorized to comment on the issue." A Saudi delegation had arrived in Istanbul to assist with the investigation, the statement said. In an interview Friday with Bloomberg reporters, the Saudi crown prince said he was "very keen to know what happened" to Khashoggi. "My understanding is he entered and he got out after a few minutes or one hour," he said. "I'm not sure. We are investigating this through the foreign ministry to see exactly what happened at that time." Despite the intense interest concerning Khashoggi's whereabouts, little concrete evidence has emerged so far. "The episode was made more confounding by the thicket of security cameras around the consulate, monitoring its entrances and perched on the walls of villas nearby. But neither government has released any video," The Washington Post's Kareem Fahim reported Saturday. Turan Kislakci, a friend of Khashoggi and the head of the Turkish-Arab Media Association told the AP on Sunday that Turkish officials had told him that Khashoggi had been killed, and to make funeral preparations. Khashoggi's fiancée, Hatice Cengiz, a Turkish national, said that she waited outside the embassy for four hours on Tuesday before calling police. Khashoggi had left his mobile phone with her, and told her to call Turkish authorities if he did not return. Their wedding was scheduled for the following day, The New York Times reports. Khashoggi is a contributor to the The Washington Post and was twice editor-in-chief of Al-Watan, a Saudi newspaper. Between those stints, he was a media adviser to Prince Turki al-Faisal, the Saudi ambassador to the U.K. and then the United States. The Committee to Protect Journalists Deputy Executive Director Robert Mahoney said in a statement that that the group was "alarmed" by the reports that Khashoggi may have been killed inside the consulate. "His disappearance could exacerbate tense relations between Turkey and Saudi Arabia, which worsened last year after Turkish President Recep Tayyip Erdogan called the Gulf States' isolation of Qatar 'inhumane and against Islamic values.' In the spring, Saudi Crown Prince Mohammed bin Salman described Turkey as one part of a 'triangle of evil' with Iran and Islamic extremists. "Press in both countries face severe restrictions. Turkey was ranked 'the world's worst jailer for the second consecutive year,' with 73 journalists behind bars in 2017, according to the Committee to Protect Journalists. "Saudi Arabia ranked as one of the world's most censored countries. Under the crown prince's leadership and despite his claims of modernization, female activists, intellectuals and critics have been swept up in arrests." U.S. Senator Chris Murphy (D-Conn.) tweeted Saturday "If this is true - that the Saudis lured a U.S. resident into their consulate and murdered him - it should represent a fundamental break in our relationship with Saudi Arabia."